Back in September, we showed you Google Instant Search, the new love-or-hate feature from Google that let’s you see results as you type. Frankly, when I first saw this, I wasn’t thrilled—like most people who use computers 8 to 12 hours a day, I type fast enough that the results just whizz by unheeded. The only way this could really be useful is if it worked for mobile, I thought. Well, now it does! Google announced Yesterday that Google Instant Search on Mobile would be rolling out to lucky iPhone and Android users. The video they included to demonstrate it had some simulated screen images and lightning fast load times, a far cry from the Google Instant for mobile demo we saw back in September when Mashable cornered a Google staffer with too few bars on his Droid 2. I’m on a WiFi connection, and it’s fairly plucky, but the loading symbol does spin for a while before I get my results. 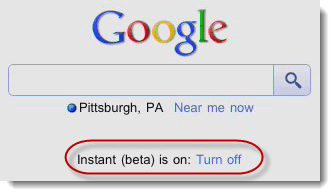 The real benefit comes with the search suggestions, which are nothing new, but now, you can get automatically get results for the first suggested answers with Google Instant. Google Instant Search for Mobile is even more useful on a smartphone, because you’ve got the location services, too, which will show you nearby results. However, on my iPhone 3GS, the screen real estate is really limited—you can really only see one Google Instant Search result without banishing the keyboard first, even though Google automatically clicks the search bar to the top to give you more room. And hitting Done is pretty much as arduous as hitting Search (i.e. not very). Those with physical keyboards will benefit the most from Google Instant Search for Mobile. Anyway, I tried it out on a few queries and it pulled up some pretty good results. But remember: this is still in beta. Google Instant Search for Mobile may occasionally crash your browser, as it did for me when running a search for “Best Buy.” No biggie, though.